Houseplants make our homes cozy and pleasing to the eye. However, not all people are patient enough to take care of these green decorations or willing to dig in the dirt. We at Bright Side found out that there are houseplants that can easily grow, even without soil. Here’s a list of them for you. If you put cloves of garlic into water, green sprouts will grow after some time. These green shoots are edible and you can add them to your salad. For a few other ideas on how you can recycle your food waste, see here. You can grow new leaves of Chinese cabbage even if you have only the bottom part of it. Place the root end in a shallow bowl of water and watch it regrow from the center. You can find more details on how to regrow this vegetable in your kitchen in this article. All you need is a glass, water, and a few bulbs of green onions to make sure you have an endless supply of this healthy vegetable. Here you will find some tips on how to regrow this useful crop. Carrot tops sprout new greens pretty quickly if you place them in a shallow bowl of water. These greens are edible, so you can add them to your salads or mix them with honey. You can find out more about growing your own carrot leaves here. © Enchanted Wellness & Fitness. To grow an endless supply of leeks at home, first make sure that their bottom parts are 2 inches long. Then place them in water. Watch this video to learn more about this method. Mint is a great addition to tea, sweets, and different sauces, and it’s pretty easy to grow. All you need to do is place its roots in water. Actually you don’t have to buy this herb at the grocery store to maintain a continuous supply. You can easily grow basil in a glass with water. You can find out more details about it here. If you want to grow rosemary in your kitchen you’ll need a few stems of this aromatic herb. Put these stems in water and soon roots will appear. However, when the roots are long enough you’ll need to plant your herbs in well-drained soil. Many people think that they can grow tulips only in gardens. However, this isn’t quite true. You can have this beautiful flower growing inside your home too. All you need to do is place tulip bulbs in a vase with a small amount of water. You can find more details on how to grow tulips in this article. This plant can grow easily without soil and it blooms with delicate beautiful flowers. 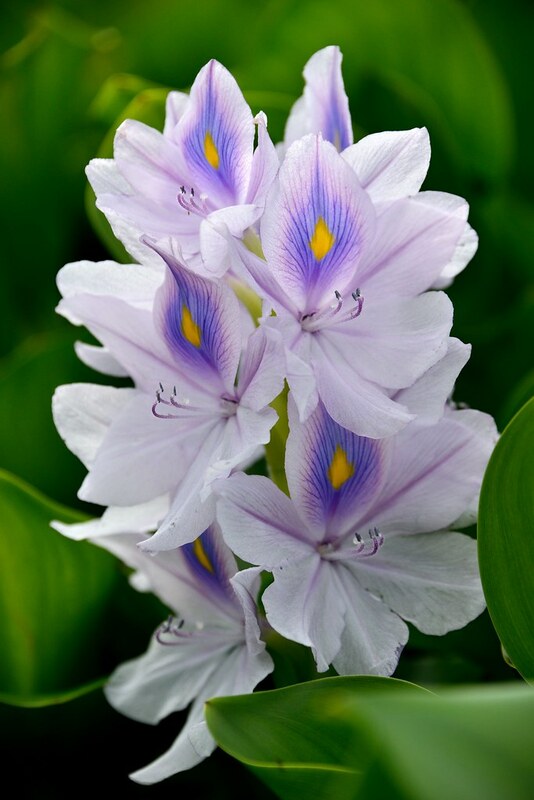 You can grow a water hyacinth in an aquarium, but check for more details here. You can easily grow these beautiful flowers at home. Place hyacinth bulbs in a vase filled with stones and a small amount of water. When growing hyacinths, make sure they get enough light. For more details check here. This is another ornamental bulbous plant which doesn’t require soil to bloom. All you need is a vase, stones to keep the bulb in a stable position, and water. You can find more details in this article. This plant looks like a thin fragile palm tree and it doesn’t require soil to grow. All it needs is water. The best container to grow papyrus in is a vase with a consistent level of water. For more details check here. Fiber optic grass gets its common name from wiry grassy leaves, which resemble fiber optic wire. It can easily grow in standing water, and it looks great in a vase. Fiber optic grass can create a mini-palm tree effect if you wrap a plastic tube around its base. Check this article for more details. Bamboo grows pretty quickly and a simple vase with water is enough for it to become a full-grown plant. There are different types of bamboo which you can grow indoors. More on this and other ideas about living decor can be found in this article. This houseplant usually grows in a pot with soil but can also grow well in water. The other name of Epipremnum aureum is Devil’s Ivy because it’s almost impossible to kill and it stays green even when kept in the dark. So, it can become a great ornamental plant for your home. You can find a few inspirational ideas here. Chinese Evergreen isn’t a water plant, it usually grows in a pot with soil. However, since it’s one of the easiest plants to grow, it feels fine in water too, though its growth won’t be as rapid as in soil. You can find more details about Chinese Evergreen in this article. These houseplants are very popular because they don’t need frequent watering and big pots to grow in. Some ideas on containers for succulents can be found here. The other popular method of growing succulents and cactuses is hydroponics. Plant a cactus in a pot filled with pebbles, and then put this pot inside another one filled with water. This exotic plant can not only grow without soil but it can even survive without water. You can find a lot of ideas on how to use this plant for home decor here. Humid air is enough for tillandsia to grow well. But you can indulge its leaves and roots with a water bath from time to time. Are you a fan of houseplants? Which plants do you have at home? Tell us in the comments below.